A fellow member of Stashbee 2016 posted about the Orlando Modern Quilt Guild's Quilts for Pulse quilt drive. More details here. 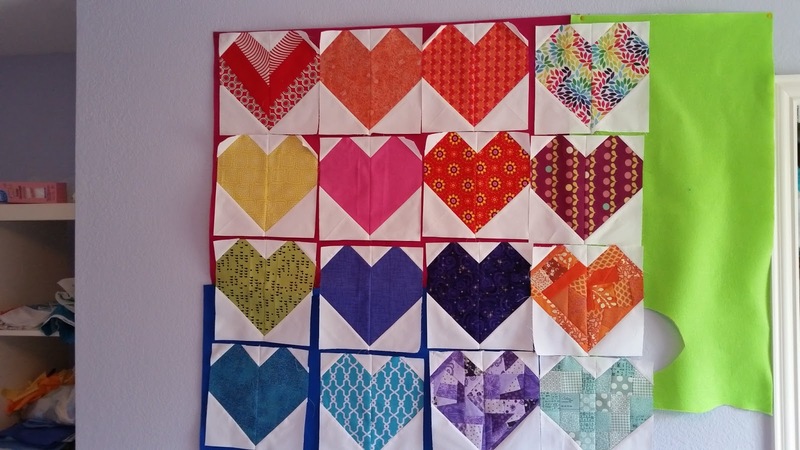 At first I was going to sign up as an individual and send a few blocks, but I decided to take the plunge and join the Dallas Modern Quilt Guild and send mine along with their donations. I hope to be able to complete a full top, but we'll see! I started with the paper-piecing templates from don't call me Betsy, because I love paper piecing. I learned, however, that I much prefer smaller scale paper piecing. Since I do not actually mind the stitch and flip of the original, I went back to the original tutorial from Cluck Cluck Sew. As I was cutting the corner pieces, I realized that the paper templates and the stitch-and-flip tutorial use different sizes for the corners. No biggie, I just measured the templates, and used a 2.5 inch square for the smaller pieces, rather than 2 inches. 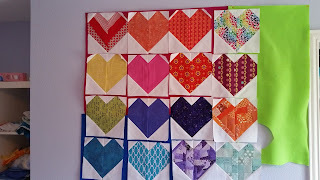 My goal is to make 4 blocks each of red, orange, yellow, green, blue, and purple, and 6 rainbow blocks, for a final quilt that is 6 blocks by 5 blocks. For each color I am doing one block as patchwork or stripes, rather than just a straight cut of fabric. We'll see - the improv patchwork I did for the purple and orange took longer than I imagined it would. Here's what I have so far - I just stuck them up as I made them - I'll arrange them into vaguely rainbow order when they are all done. I think I will also end up scrapping the red on the upper left. The strips ended up wonky from one side to another. I stuck it up there hoping it would grow on me, but it isn't.